Suspension systems in today’s industrial equipment are evolving. Traditional passive spring and damper systems react to load inputs from the wheels and body, and exhibit relatively constant spring rates and damping forces regardless of the road and load conditions. In contrast, adaptive suspension systems continuously alter their suspension settings in real time to suit different driving or road surface conditions providing improved dynamic stability. 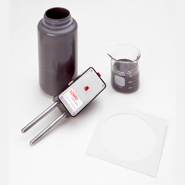 During our long history, LORD has gained experience designing dampers with varying capabilities. Our systems are incredibly flexible and well-suited to a wide range of applications with damper forces ranging from 1,700 N to 38,000 N (and higher). LORD Corporation offers unique adaptive suspensions that leverage our proprietary Magneto-Rheological (MR) fluid technology, which support different suspension applications including primary (axle), cab, seating and more. 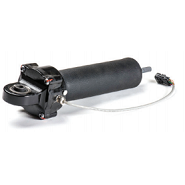 To learn more, view our MR Suspension Systems Brochure or see How an MR Damper Works. 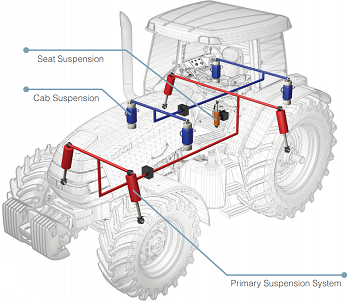 Traditional cab suspension systems must typically compromise ride comfort and stability. LORD MR Cab Suspensions, however, offer a solution to manage these conflicting goals. LORD Corporation has produced more than 250,000 seat suspension systems since 1998 for various Agricultural, Construction and Commercial Vehicles. 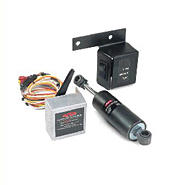 Our system includes a damper, an integrated position sensor, and an optional ride mode switch. 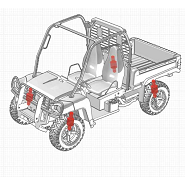 Originally developed for military applications, MR primary suspension systems have since been demonstrated on other industrial applications with the verified benefits of improved ride comfort, vehicle stability, safety, speed, productivity and durability.